How do you feel about gray rooms? Tired of seeing them everywhere or still loving them? If you have any in your house, are you “cheering them up” for spring? Check out Konig’s column for her advice on adding color to gray rooms. Living room at top of post via Apartment Therapy. Second gray living room via Dwellers Without Decorators. I never really got into the gray thing. I prefer warmer, earthier shades and colours. Love grey. It is easy to live with. Less glaring than a stark white. It is great with touches of blue. I think if you aren’t careful, gray can be cold. I would LOVE LOVE LOVE gray. I want gray kitchen cabinets, I want a gray bedroom…BUT living in the Ohio Valley with a serious lack of sunshine and vitamin D. I might kill someone (or myself). So, to protect all of humanity (and myself) I will refrain. However, if I ever find my self living in Phoenix AZ again OR anywhere Florida. I am all over that! I’ve resisted the gray trend so far. It wasn’t hard since a) my house is mostly bright cheerful colors and gray wouldn’t really look good, and b) if something is everywhere it makes me want it less. I don’t want to do what everyone else is doing. That sometimes means I do nothing, though, so it’s kind of a catch-22. Jessica, that is exactly what I think as well…. both your a) and b)! Agreed. I’m not a “trend” person when it comes to my home. I like what I like and I like to use colours that make me feel good. I don’t use a colour because a magazine says this is the “must have” colour of the season. Haha!!! Love the last sentence of your post!! I recently painted my kitchen Potters Clay from Martha Stewart, a color that looks gray but has brown and red undertones that transition to a deep champagne taupe in different levels of light. My kitchen has the trendy look without being dull. I think the light-absorbing grays- shades wthout warm undertones- are a trend that will fade, much like furniture constructed of splinter-ridden shipping pallets. I think it’s really unfair to people to have trends that “get old” after awhile. Are people supposed to redecorate/paint their homes everytime a new trend comes along? I love the idea of freshening up a space with some new color, but the idea that something becomes oversaturated or gets old is just unrealistic. If you’ve painted rooms in your house gray, don’t feel you need to paint just because designers are telling you to move onto something else. 😉 Great post, Julia! Absolutely agree. While I don’t feel the urge for an all gray room, we have used a soft gray with hints of blue on some walls and it has lasted for years, even as the decor changed. As an example, although it is a different color, our home came with an all black guest bathroom and we kept that as well, only painting the walls a lovely soft green to add light. But the black counter, toilet, floor tiles, etc…they all stayed and people love the room. It looks nice with soft lighting and candles during parties, very dramatic yet inviting. I use the trends lightly. So true…back away from the bandwagon Kool-aid! In my book, gray is the dismal color of soot, smog, etc. I don’t understand why anyone would want to paint their interior rooms that color. Perhaps a grayish off-white, but not the gray rooms we’ve been seeing the past few years. I guess I like room colors to be painted a color that makes me feel happy.. and grey just does not make me feel happy. I tend to be a neutral person- but grey as a neutral is kind of depressing to me. I’ve been wanting to use gray as a neutral in our kitchen for the walls. I think it will look nice with our white cabinets, but I do agree that pops of color will be key to keeping the room from being too cold! Love it! Just painted my infant girl’s nursery gray and pink! I painted my living room Benjamin Moore’s Ashley Gray about 8 years ago. Normally just having “gray” in the name of the paint colour would have scared me off but this shade makes the room very cozy at night. I have however tired of it in the daytime. I read an article where the writer said she decorated her first home the way she thought grown ups should decorate. 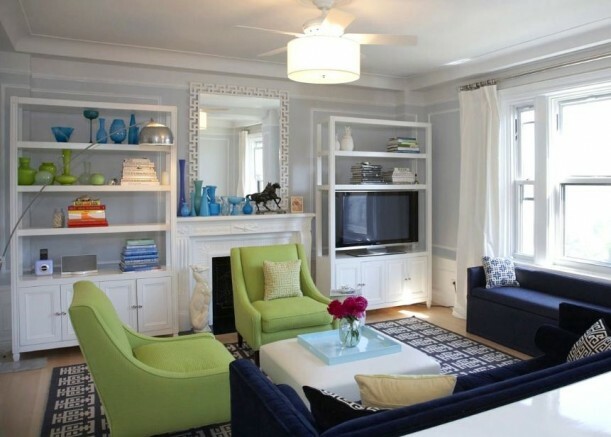 Years later she redecorated to the style that suits her, which is beachy and coastal. I can so relate. After having been in my home for ten years I am at the stage redecorating and this time round it will be light and fresh. I decided if I can’t afford a cottage yet I’ll make my home feel like one. After years of living in the Midwest and thinking I couldn’t have beachy colors in my house I painted everything in yellow, blue and seaglass green with white trim and cabinets and it is wonderfully cheerful. I too have my beachside cottage inside my Hoosier farmhouse. I never really got into it. I like more color. When we bought our house a little over a year ago, the whole interior was grey. It felt so cold and empty, so the first project was to paint. We painted the house Shaker Beige (Benjamin Moore) which really warmed up the rooms. I’m not one to follow trends. I like to use colors that we like, and making it comfortable is more then just have good seating. As a quilter, color is something that I work with almost everyday, so for me, it is important to have an eye pleasing setting. It’s hard to see real colors with my camera, but here is a glimpse of what it was (the color really was grey, not white) and where we took it. I’m doing a waffle next week on gray kitchens, so I’ve been doing a lot of research on them. I thought I would find gray kitchens kind of drab, but with the right accents and architecture gray can look fab. I think it’s just when it’s a boring room with uninspired decor that gray can look down in the dumps-ish. I didn’t realize this was a trend! I think it could work if the room got a lot of light and if the furniture and decorations had more vibrant colors. grey rooms might work in some houses, but my drab grey-lavender grey walls in the living room were long past due for some brightening up. We just painted them a sprite-y springy green and I love it! I would never have gray walls. Too depressing for me. I do, though, have light gray laminate kitchen floors that I love…changing to light gray for the floors was me being brave and not doing the beige brown safe neutral color thing for once. Gray in an old house with warm wood floors and warm-colored furnishings is okay, but not for me. Gray walls with all modern furnishings in a city apartment – ugh! I’m really into gray right now in general — rooms, clothing, etc. I love it! I also love bright color, but prefer to accent with it rather than splash it on my walls. I wouldn’t ever paint gray and then decorate with desaturated “color” in a room — I would love to punch it up with the bright spring.summer colors as suggested. Also, white trim makes for a fantastic contrast. I like the gray used in the Dwellers without Decorators image you posted above, but the darker gray in the first photo is wayyyyy too dark for me. I love a spacious feeling room and that (while bold and interesting) is too restrictive feeling for a wall color. They work much better as accents, for me. I’m a redhead. I look GOOD in gray. My daughters are redheads. They look GOOD in gray! But… gray interiors depress the heck outta me! Instantly. Brown does too. I live in Washington state, where gray skies “every now and then” actually turn blue! Yes, we do the happy dance! Gray gray, go away. I was going to say the same thing!! I wear a LOT of grey, because I look good in grey and grey is a great backdrop for colorful accessories. I cannot, however, follow the same fashion trend in my house. Walls are cheery pale colors, furniture is colorful without being vibrant, and accessories change with my mood and the season. Doing anything permanent in the house with grey seems too depressing … no matter what the undertones may me. I knew grey was a trend right now, and I like grey walls, though I have not painted any of mine that color. No matter the colors I do decide to decorate with, I could care less what others think. I am a big proponent of doing what pleases you with no regard for what other people, including ‘designers’ and ‘decorators’, tell you is hip and trendy, after all, it just their opinion, not fact, and they don’t have to live in your house. If grey walls make you love your space and make you happy, then who the heck cares if suddenly grey is no longer ‘in’. If you think about it, every year there is one new ‘trend’ or the other, that gets dumped as quickly as it began. Constantly trying to follow and keep up with the latest trends can be very time and money consuming, not to mention has the potential to leave one feeling very unsatisfied. Gray is my favorite color for exteriors. It looks so crisp with white trim and is a great background for all the shades of green in the garden. But gray interiors? Not so much, especially in cloudy western Oregon. While I love the look of those Belgian old world gray rooms, it would never work for me. My 1920’s house has the original stained woodwork in the main rooms and gray would look awful with the warm wood tones, and I can’t see liming or whitewashing the original moldings and floor, nor painting the antique furniture to follow a trend. Plus I couldn’t live with the monochromatic no-color scheme, as much as I might admire it on a blog or in a magazine. When my son was a teenager, his room was a pale gray with white trim and a mostly black plaid comforter. I always thought it was really cold looking and changed it when he got a place of his own. I love the look of warm rustic woods and I think the gray color scheme looks best with light toned finishes – white, limed, bleached, pickled, stripped pine or oak, weathered gray, or palest blues and greens – on wood pieces. Have you seen the giant Restoration Hardware catalog? Everything is gray. Ugh. Is this a reflection of our economic times? I’m ready for the next trend to make an appearance, but I have to admit I’m not fond of the super bright saturated colors especially mixed together with no apparent rhyme or reason as seen on the more youth oriented design blogs. I personally like gray. All these gray naysayers are making my roots sad. Who can keep painting their walls and cabinets every time someone in a magazine or on a blog tells them to?! I say if you love it, go for it. But it’s a hard color to pull off without it looking dreary and cold. I’d rather do accent pieces with the trend like that. Gray bedding or pillows? Yes please. Re-painting my entire kitchen? No thanks. I have seen many sophisticated, beautiful gray rooms, but personally I feel like it’s becoming overdone, & I’m getting a bit tired of the trend. Maybe it’s what I like to call the “Pinterest Effect”- where beautiful images are shared in an instant, but it seems that suddenly everyone hops on every trend these days- making things feel “tired” to me much more quickly? Don’t get me wrong, my sister has a gray room that I love and I have a bedroom which I would consider more pale silver, than gray, but once something is everywhere, I start getting bored with it, and I’m there with gray right now. Erin, I completely agree with the “Pinterest Effect” — in fact, before Pinterest existed, I was having the same problem from following so many design blogs. I have since pared my reader down quite a bit, and it has helped immensely. The more popular something becomes, the less likely I am to want any part of it, so I just have to laugh when something I feel like I’ve seen everywhere online finally hits the stores in my area and everyone around me acts like it’s the next big thing when I’ve already been sick of it for months! My philosophy is: be an early adopter (before it becomes a trend), or else wait until the trend has passed… if it’s no longer popular but you still love it, go for it! As for gray, I am still back-and-forth. I love the look in modern spaces, or in houses with great architectural details, but in my normal old tiny house (in perpetually-gray Washington) I can’t see it working so well. Plus the combo I like best is charcoal & a variety of pinks with white accents — and my husband has permanently vetoed that! “The Pinterest Effect” perfectly describes my state of mind these days as I think about finding a new home and decorating it. I was a firm believer in white kitchens, and I still love them, but having seen so many on Pinterest (a recent addiction that’s killing hours these days), I’ve gone back to liking (reclaimed) wood. Thanks to Pinterest, I’m overwhelmed with ideas and beautiful images these days and it’s having a definite effect on my taste and ideas. I’m condo-hunting in Boston, and seeing many places decorated completely in monochrome — barely a touch of color anywhere. If I didn’t find it so amusing, all that white, black, and gray would be terribly depressing! But dark, WARM gray walls, surrounded by lots of rich wood tones and deep colors (oriental rugs, dark upholstery) etc. now strike me as an interesting and sophisticated backdrop for a collection of framed paintings and prints. Like you, the more I see something, the less I’m drawn to it. I’m Ms. Anti-Trend: if I see something in more than two newly renovated condos around here, I want nothing to do with it. (My search has dragged on more than 2 years.) I don’t watch TV but I probably should so I can see what’s coming down the pike that I’ll dislike next! It’s still a “go” for me with lots of white and bright accents…I like the silver and taupey greys. I’ve always been a “Brown” girl myself. But I have always loved Martha Stewart’s homes that have alot of it. To me, grey (and brown) are timeless…. I find grey very drab and depressing. It’s not a colour that inspires me and I find it “cold” and uninviting. I like to use colours that warm the soul and make everyone feel welcome and happy. I’m not a trend person. Just because a magazine or designer says this is the “must have” colour of the season, it doesn’t mean I’m jumping on the bandwagon to decorate my home in that colour. I also feel that art should inspire your emotions and not “match” your living space. I love the way Rita Konig writes – she could convince me of almost anything, plus I’m half way there with this one. I’m finding a lot of shabby-chic, grey, beige (sorry, taupe) very tired, like staring at a bowl of porridge. And I know exactly what she means about the artful flea market finds. I think for me it’s partly too much time spent on the internet looking at Pinterest when I should be working that leads to this ennui. Here in the UK the property pages and glossies have a lot of ‘for sale’ ads where it’s all polished wood floors, loads of glass, glass topped dining tables and leather chairs, plus massive headboards, acres of space between furniture. Very cold and characterless. I think personality should come out when one decorates, and if you truly have what you love it will never ‘get old’ for you, and that’s all that matters. As ever, a thought-provoking post, and a great blog, Julia! There are so many beautiful shades of grey. I love the color and I think it is a great neutral. I have grey in my family room and in the spring in summer I bring in turquoise and green accents and in the winter I bring in red. Grey is a great backdrop and I do not find it drab in the least. I think she has a good point. I’ve seen some Restoration Hardward catalogs that were very stark and completely lacked any color. That said, I still like gray. And the only completely monochromatic room I’ve ever seen was in a magazine. I think the average person is JUST now discovering gray and that it will stick around for awhile, save the super fashion and interior conscience. I still like white walls, call me crazy! However, I do like the gray wall trend more than the tan wall trend. I don’t like gray alone, but mixed with colors like blue and green, it can look nice. I will say though, I would much prefer to have cheery colors on my walls than gray. I find all grey schemes to be so depressing. I feel like all this burlap, solid plain white, and grey is just “decorating” for the masses. It is so simple that anyone without any skill can do it. Combined with some (junk) treasures from a flea and voila, instant decorator. I love a good flea but some of the stuff you see people use right now I wouldn’t put in a hen house let alone my house. I much prefer and feel there will always be a market for a palette that requires much more artist skill and a cultivated design sense. Not only is the all grey scheme very accessible it is also a respite from busy overstimulated lives. But, I don’t feel that surrounding ourselves in blah sameness is the answer to an overstimulated over worked life. Stop tweeting, pinning, facebooking, texting, & emailing so much so one can slow down and appreciate beauty, the subtle beauty that can be found in details, color, and a artist life in general. I agree with you Sweetpea. I am so over the all white and all gray rooms. You would think that since the state of our society is depressing people would at least want to express a more creative colorful side. Empress Lockness I agree with you 100% I have NEVER been a fan of the gray and never will be. Life is depressing enough without living in 4 walls of dull gray. Give me some color! Also, sweetpea, you are spot on with your assessment too. I couldn’t have said it better myself! I’ve mostly seen the use of the gray “trend” on Apartment Therapy. I’ve seen a few examples that I like on that site, but it is not for me, although I don’t mind seeing it in other people’s homes. I certainly wouldn’t use itin my home and especially if you lived in a region where clouldy skies and lack of sunshine were the norm. No, that would be far too depressing and dreary. I’ve used lighter colors in my house, more various shades of green, and one room that is a very pale, faded teal. I think they work better in a smaller home and it doesn’t limit the artwork as much either, but the colors are not boring white either, which I grew to dislike given the limitations or renting. I’ve used a more saturated color in my kitchen blacksplash as it is a smaller area. The funny thing is–is that my husband and I were nervous to use the color because we thought it would close the space in and be too dark, but we love it. I like the use of accent walls with deeper colors instead of entire rooms. I heard that was an outdated trend too. Oh well. I appreciate the gray in pictures of other people’s homes I won’t have it in mine. Living in western PA and having 7+ months of gray winter sky every year is enough for me! I need color. I have read that yellow is out, but my foyer and living room are the most joyful and sunny shade of yellow (white raisin by Sherwin Williams) and that makes me happy in spite of such a long stretch of gray weather. I don’t know how people who live in regions like myself can like gray on the inside when it’s all that is on the outside. I tried to go with gray when I painted my family room. It is a green gray. I really don’t like it!! I want to repaint it – too many other projects right now!! I guess I like warmer colors. The gray has never worked for me in this house because all of the trim is wood here, and to really pull off a good gray room, you need white trim (at least in my mind you do.) I love to see the combo of gray with yellow… a good contrast there. When something becomes “the norm” everywhere, whether it was blue and mauve in the 70’s, hunter green in the 80’s, or gray now, people lose interest in it. Its newness wears off, and people start looking for another “new”. That’s the case with anything, clothing, food, music. I love color and use it everywhere with a neutral khaki…and have done it for a number of years. It works for me no matter what the season, BUT it took me a very long time to reach that point (and MANY repainted rooms and reupholstered pieces.) Maybe maturity helps! I really like gray rooms, and I have not grown tired of them at all. I especially like gray rooms (almost any shade) with bright white trim and wainscoting. I do agree with adding pops of color to the room during spring and summer. I have a gray quilt and shams from Restoration Hardware on my bed right now, and I am considering buying a couple of green pillows to toss on the bed to add a bit of color. I love how gray and green look together. It reminds me of a spring day when a thunderstorm is about to roll in. The sky gets dark but the grass and trees still look bright green. I don’t mind it in other people’s houses, but it’s not for me. Like some of the others, gray just doesn’t grab me. Never has, but I do like some of the grayed out versions of beige. Guess I need the warmth. 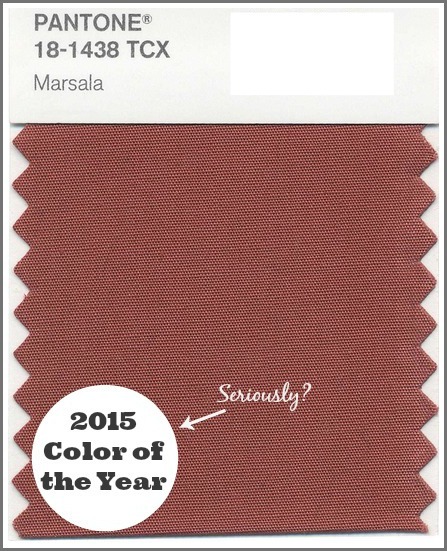 Does anybody remember the gray and maroon trend in the early 90’s, particularly for offices? I didn’t like gray then. However, I really, really don’t like orange-y wood, which some of the brown trend had, particularly in wood floors. I would rather have gray than that. I love white walls – I think. I love it in pictures, but that may not translate to real life. Maybe I’m just a blue-painted-walls person. I know I love that. I do remember that trend! I worked as a designer’s assistant at the time and we filled some clients’ houses with miles of gray carpet. I’m sure it’s all been ripped out by now. I love gray mixed with giant pops of colour – teals and pinks (especially fuchsia). I’ve never really been a gray fan. Besides that, what’s worse than following a trend? But if you love gray, have always loved it, and used it before the trend, I say keep on keep’n on! But following a trend is just not for me. I’ve never really cared for grey,(I’m a Florida girl, so I love color) although just yesterday I was considering adding some grey fabric to my stash (it’s big in quilting fabric now, but I dont own any). Several years ago, I was tempted to paint my family room gray until I read the “name” on the paint chip. Now who would ever paint a room in their house called “Dreary Morning”??? “Dreary Morning”? Yeah, that doesn’t sound very appealing! Ha. I absolutely love grey, in all shades! The contrast it gives with white, black, & many other colors makes it a favorite. Also, it is a great neutral and can even have warm undertones (think paint color BM Edgecomb Grey). Hope this is not just a trend but will become a “classic” color. Grey…or gray…is tricky. It usually has undertones that go blue, purple, pink, and even a warm yellow making it skew taupey. So I would say it all depends on what you pair it with. You can make it look drab or clean and fresh or flat and cold. I do think the washed out restoration hardware/belgian trend is quickly getting old (pretty and calming but old – at least for me) TOOOOO many rooms like that would make me want for some pop of something – Even just some contrast! But a nice clean gray like Farrow and Balls elephant breath or pavillion gray…can make a beautiful neutral backdrop that can work with contemporary and traditional. Interesting topic. I used what I considered a taupe color when we painted the outside of our home. The existing roof was a light grey. I’ve always noticed that he taupe color changes subtly throughout the day, depending on the angle of the sun and the shadows. It either looks grey or green or a combination of both. Most people see a tan color, but not everyone discerns subtle color variations either. I’m still lovin’ the gray thing, but more as a background with pops of white and color so it looks fresh, not dark and steely…brrrr…. I love my dark gray kitchen walls. I have light birch cabinets and bright white woodwork combined with white & black ceramic tile floors. The cabinets pop off the gray and look much more contemporary with new hardware than they did with the old wall paper. I’d really love a total kitchen re-do but for now I’ll be happy with my gray paint! I have recently painted my dining area and living room two different shades of gray. I absolutely love it! It took me a while to make the decision. I have preferred creamy whites before. I also went with grays that had yellow undertones instead of blue. This makes them have a much warmer feeling. I also trimmed in bright white to give it pop. Right now I am ready to do the rest of the house! Just love it! I’ve never been a fan of it on walls. To me it’s either cold or depressing, an overcast drizzle dreary day. There is the exception when it’s just the right color in just the right light, with just the right pop of color or white, but that’s the exception IMHO. I could never use it in my house as it doesn’t get enough natural light (bane of my existence). Also I don’t think of anything as dark gray, I think of it as charcoal, which is totally different to me – still couldn’t get away with it in my low light house though. I will have to say I live in Florida, the sunshine state, so light (although can still be dependent on architecture) is not as much a problem as more northern regions. I think the right shade of gray matters and ultimately, you just have to like it. An all gray room! From furniture to walls? Not for me. But a pale gray can be refreshing rather than gloomy as long as more color is added to the room. I like it when it is done well. I have a grey room in my house that I really love. It has a lot of white trim and accent colors. I plan on painting the master bath a shade of grey and trying that out. Any color can be done badly. It seems to me that if you look back in time there has always been a grey and something else trend. Its a classic. But now that it’s trendy, it will be done badly and people will get sick of seeing so much of it. Then maybe that teal green and pink thing will come back and I can go in my mom’s attic and dig some treasures out :-). I love gray. I painted the walls of a room in an apartment a couple years ago Silver Cuff Links. It was a bold choice for me, and I was afraid eventually it would feel like a prison/cold/institutional, but I loved it as soon as it was on the walls and everyone else seemed to really like it too. I felt very happy in that room. Gray is a fabulous color for interiors because unlike blucky beige it has the ability to make the other colors used with it look better. Gray can have a very magical quality on a wall which goes against our normal mindset of gray being blah or draining. In historic homes Dove Gray is a fantastic accompaniment to ornate white molding, it gives the room life. For contemporary homes it makes the perfect foil for hot fun colors. Where is can get a bit iffy is when it it used with blonde floors or with dark brown or mahogany floors absent a nice strip of white baseboard. Gray, tone on tone on tone, is about as interesting as Ballard Beige. Hence, Greige was born. Not a fan. If everything looks dull, icy, bleak, fogged over, smogged up . . . the effect is chilly and unwelcoming. Personally, I’m glad to see color making a comeback. Even colors I wouldn’t use myself. Any color is better than the absence of color. Isn’t a sunshine-y day a mood booster over a gray day?? Yup. I think so, too. Hi Julia – I did a post or two on the gray phenomenon…but I do not have a single bit of gray in my home. I seem to recommend it to clients who only want white and light colors…but in my own home oh no. I need color. But, if I did use gray, I’d be pairing it with deep eggplant and a warm. neutral ochre – which are the colors of a barkcloth chair my mother had in the living room when I was a kid. I loved it then…love the combo now! I love gray / grey! Love it! To each their own. It makes me happy and that’s what counts. Gray will work as long as there is plenty of white trim work to offset it depressing tone. loved gray, i say loveD because i had a million swatches up on the wall of my beach house bedroom. i was so in love with that gray popping against all the white trim. finally went with stonington gray (a lovely gray blue)… looked AWFUL. dreadfully depressing. didn’t work for the rooms i was painting so i repainted (& primed) & went to edgecomb gray. although incredibly warm & pretty at a certain light the color looks choppy with all my half & angled walls and sometimes skews an ugly gray yellow green. i am going to summom up the strength to paint one more final time… using my stand by, always works for my beach house… white dove. i was exhausted & very disappointed by the process of trying to go gray. i think in certain situations (lighting plays a big part) gray can look amazing. obviously not in my place. i think i’m naturally drawn to mostly warm colors.